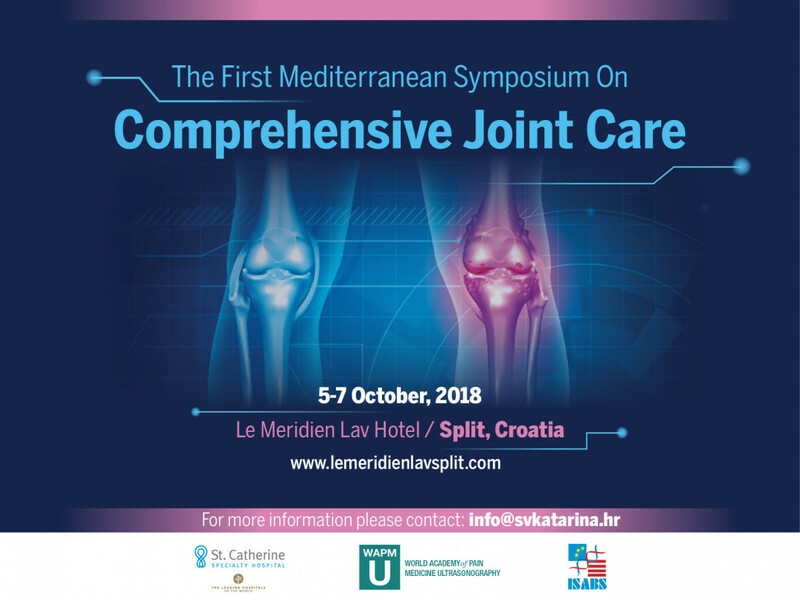 On behalf of the Conference Scientific Committee, we invite you to attend First Mediterranean Symposium of Comprehensive Joint Care to be held in the hotel Le Meridien Lav (www.lemeridienlavsplit.com), Split, Croatia, October 5-7, 2018. Conference organisers are St. Catherine Hospital (www.svkatarina.hr/), World Academy of Pain Medicine Ultrasonography (www.wapmu.org) and International Society for Applied Biological Sciences (www.isabs.hr). The conference is endorsed by European Pain Federation (www.europeanpainfederation.eu) while the co-organisers are: University of Split School of Medicine and The Croatian Pain Society. Lecturers, coming from eight countries, are world-renowned experts in the fields of pain management, sports medicine and orthopaedics. Lecturers are coming from some of the most prestigious universities in the world, such as Stanford University, Mayo Clinic, Wake Forest University, Penn State University, University of Toronto, Innsbruck Medical University, Maastricht University Medical Center etc.